10 Feet Wide = Deluxe Comfort! Just imagine you and your friends and family are casting off for a fun and leisurely pontoon boating adventure. You’ve pulled your pontoon easily out of the garage this morning, REALLY, and you’ve trailered it like a champ to the ramp via your highly efficient Float-On trailer. As your crew prepares to board at the dock, they stare in awe as your nifty pontoon boat expands on command, right in front of their eyes! The Island Boats 18/22 and 22/26 are the only two boats in the world with the revolutionary patented R & E Slide, an engineering marvel that allows the floor of these boats to retract or expand in less than two minutes. In the retracted position, the boats store and trailer just like a monohull. 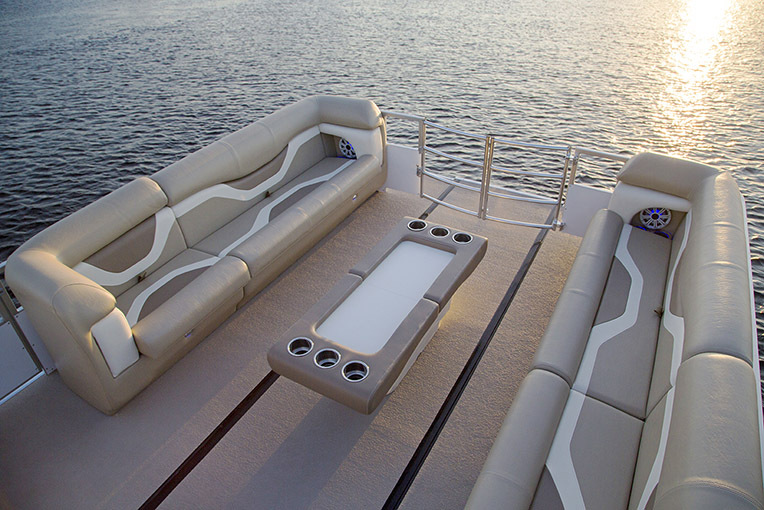 But when you expand, you create a boat of awesome proportions, ideal for entertaining and relaxation! Everyone climbs aboard and relaxes in deluxe comfort as the Island Boats pontoon boat adventure continues! With abundant seating and storage throughout, plus two large kidney-shaped tables, there’s plenty of room for lounging in the sun, storing your water toys, cruising, grilling, restaurant hopping and more! Beaching is a breeze with three doors – one forward, aft and port side. Two of the doors are even handicap accessible! Getting too much sun? No problem. The Island Boats Pontoon Boat comes with a bimini top that actually expands with the boat. Pretty nifty huh?